allows you to tag your own spots in the city and to view others’ tags. you feel a bit like you’re in a video game. 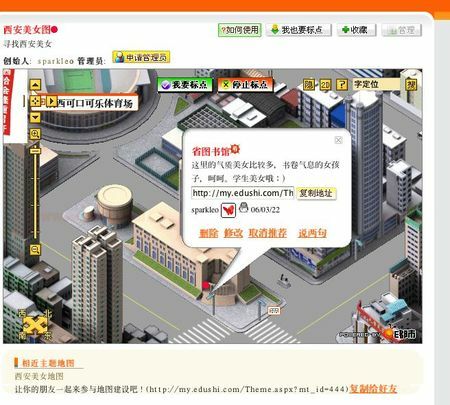 as you scroll over the cityscapes, the names of buildings and parks pop up. you can search by building name, store name, neighborhood name, or address. public toilets, to the above map of of “beautiful women.” Note the Shaanxi Coca Cola Arena in the upper lefthand corner. The only tag on the map so far has been posted by sparkleo. It’s the Shaanxi Provincial Library. “A lot of girls here, girls with the scent of books…” Below his tag, other registered users can delete or comment on his tag, or add their own. The only thing I wasn’t crazy about were the long red scrolls that float around on balloons, offering advertising space or even promoting national slogans.